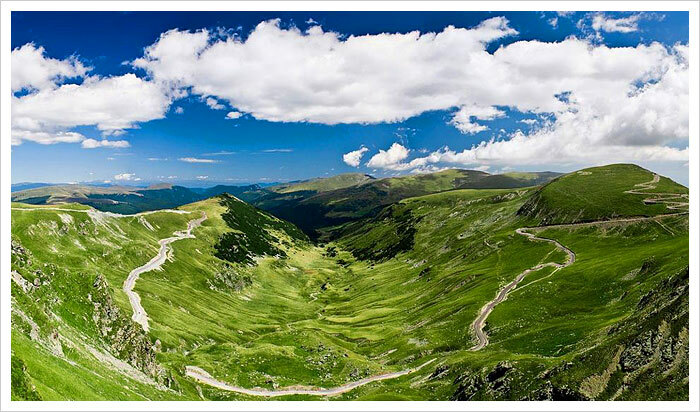 Arguably the oldest road over the Carpathian Mountains, TransAlpina was built at the beginning of the 2nd Century AD by the Roman legions during their war campaign to conquer Sarmizegetusa – the capital of Dacia (modern-day Romania). After the conquest of Dacia, the Romans have used the TransAlpina to transport to Rome the gold extracted from the central part of Romania (Transylvania). 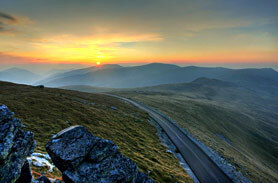 At the beginning of the second millennium TransAlpina has become one of the main transhumance routes over the Carpathian Mountains; it still serves this purpose, even today. Paving of the road began in 1930 and eight years later King Carol II inaugurated the new TransAlpina (also named during the monarchy period "the The King's Road"). The TransAlpina ranges in elevation from 1,476 feet at Novaci to almost 7,040 feet at Pasul Urdele; it connects central Romania (Transylvania) with Oltenia the western part of southern Romania (also called Walachia or according to some old maps "TransAlpina"). Distance: 87 miles (139 kilometers). Targu Jiu (28 miles SW), Ramnicu Valcea (52 miles E) of Novaci. Route time: 2 hours and 45 minutes. Horezu Monastery (UNESCO) & pottery center.